Are you a lover of Peppers? If so, then you are possibly aware of the satisfaction of eating peppers that have been freshly grown in your very own garden. It’s pretty easy to arrange such a set-up, which will give you organic and healthy hot peppers whenever you need them. We all know how costly organic food can be and by growing them yourself, you’ll definitely be saving some bucks and at the same time, enjoy an activity for family bonding which will help you get closer to your loved ones. You can follow this guide by Nigella Lawson to create the perfect Chilli jam. Let’s start with why you need a raised bed. The answer simply is that they are much easier to make and use. You can make them simply by using any spare wood. However, if you want something more appealing, then look for a nice container. If you are a fan of the different types of peppers and want them all, then you’ll have to do your research on them all as every single type has some different requirements. These requirements may be as basic as having different water and pH requirements which mean that such peppers cannot grow in the same soil. By using the raised beds, you’ll be able to separate the peppers with similar needs. However, getting a bed doesn’t mean that the plants won’t need any support. You can give them this support by using simple items such as wooden stakes or frames. We’ve already talked about the importance of pH levels for growing peppers, so let’s discuss it in more detail now. While every plant and plant species has its own requirements, most pepper plants grow well in slightly acidic soil. pH level is divided on a scale of 1-14; with 1-7 being acidic, while 7-14 is alkaline. A “slightly acidic” pH level is to around 5-7, but this may vary depending on the particular species that you want. For example, Carolina Reaper plant grows well when the soil’s pH is near 6.5, but other varieties such as ghost peppers can survive a pH range of 6-6.8. So this means that by using soil with 6.5 pH level, you can easily grow both these varieties on the same bed. 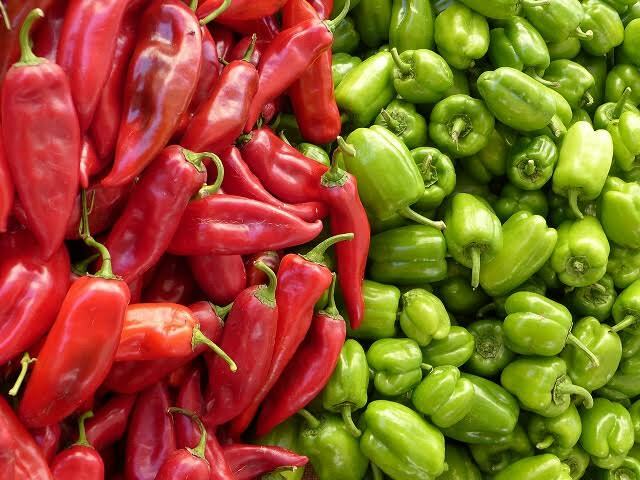 But this won’t be applicable for a pepper type that prefers a very different pH level – for example, the traditional capsicum which needs 5.5pH. So for such varieties, you’ll obviously need a different bed. So one of the first steps you’ll be taking is to check the pH levels of your soil. And what if yours is more on the alkaline side? There’s absolutely no need to worry about it as there are a number of ways to fix this problem. The most common one is probably the use of compost, but there are also some much simpler ways such as the use of acidic fruits and vegetables like lemons, oranges or grapefruit. Growing your veggies at home gives you the additional benefit of using the organic leftovers for your benefit. For example, you can use the leftovers to create mulch which will both enrich and insulate the soil for your peppers. Or you can use it to make your very own fertiliser in the form of compost for improving the quality of your plants. You can add acidity to this compost by adding in some lemon leftovers and then using it to adjust the soil’s pH levels as per your requirements. Such recycling will be beneficial in many ways as it’ll save both your time and money while providing your plants with the rich nutrients they need to grow well. Homegrown peppers offer an additional advantage of being free of contact with any toxic or harmful agent such as a pesticide. This means that your peppers are always healthy and safe to eat. From time to time, you’ll also have to supply your peppers with some other nutrients such as good amounts of Calcium in the form of a good quality calcium powder. Now you might not be in favour of using the calcium powder available at the supermarket because of the additives and preservatives used in them. So look for more natural sources such as the leftover bones available from the local butcher. These will provide your plants with a pure and rich source of calcium. Another alternative is the use of fish remains to provide the peppers with some Nitrogen. So you can see that these plants are not much different from us humans as just like us, they too need a balanced diet that’s rich in nutrients for healthy growth. Once you start producing peppers at home, you will have a good amount of seeds at your disposal. While this may tempt you to plant all the seeds, the smart move here will be to maintain a seed bank as a back-up in case anything goes wrong. It’s likely that your peppers will go through tough times such as drastic weather changes or perhaps even an infection, and in such times, having a seed bank will be a life-saver. So make sure that you keep a reserve of every type of pepper that you grow, in the shape of its seeds. This information is aimed at helping you realise that growing quality peppers at home isn’t a very difficult task. All you need is some planning and effort and in no time you’ll be enjoying the most delicious and healthy peppers you’ve ever had. And how blessed will you feel when you enjoy the satisfaction that these peppers came from your very own backyard!